Video: What Happens To An iPhone 5 Being Zapped By 5 Overpowered Lasers At Once? | OhGizmo! Video: What Happens To An iPhone 5 Being Zapped By 5 Overpowered Lasers At Once? By David Ponce on 10/01/12 • Leave a comment! The same thing that happens to any other cellphone, of course! But if there’s one tradition that seems to have held up over the last few years is the filming of gratuitous and wanton destruction of every new iPhone with as creative an arsenal as possible. We don’t find lasers particularly creative, to be honest, but it’s just one level of sophistication above guns, so we’re going to write about it. 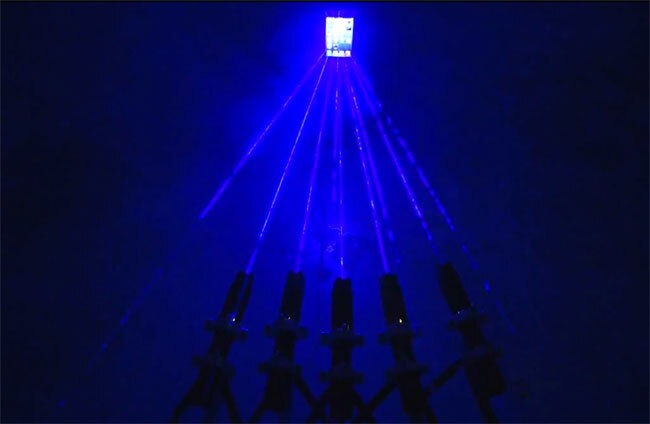 Above is a video of five of WickedLaser’s Spyder III Arctic 1.25W blue lasers (regular pointers are about 5 mW) pointed at the iPhone 5 all at once. The phone from Cupertino doesn’t enjoy the heat but keeps on ticking, despite the melted spot on the screen. But it’s done in completely by the company’s Torch, a 4,100 Lumen behemoth flashlight that eats through its batteries in 5 minutes of operation. It’s an obvious marketing ploy, but we don’t care so much when we’re mildly entertained.